Product #60600 | SKU HLX-9AG | 0.0 (no ratings yet) Thanks for your rating! Core SWX HELIX 9 Mini 3-Stud is the most complete on-board battery system ever offered to the cinematic industry. The system encompasses all the features of Hypercore, with the added function of dual 14v/28v simultaneous voltage output, answering the call for better designed and performing, on-board high voltage solutions. Leveraging a proprietary, patent pending technology, Helix is ultra efficient, providing nearly lossless power transmission at 99% efficiency rate to high voltage operating equipment. Helix's unique design allows it to output up to 33.6v, within the top range of high voltage acceptance, thus drawing less current, creating less heat and extending both operational runtime and product longevity. Helix's uniquely designed infrastructure allows the pack to function as a standard Gold mount 14v pack in all applications without the fear of accidentally transmitting high voltage. 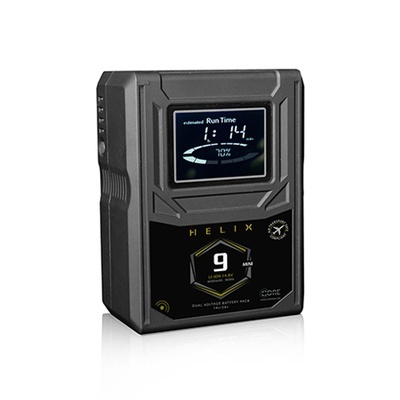 Along with standard powering applications, Helix charges on all standard gold mount Lithium-Ion equipment, including Anton/Bauer, allowing it to seamlessly integrate into your current fleet of battery packs. Core has produced a series of mount plate offerings for high voltage accepting equipment. To unlock the high voltage output function, couple HELIX with the mount plate. Once mounted, the battery pack will transmit the higher voltage efficiently to the camera, yet still have access to 14v for other production accessories. In addition, the battery mount plates are compatible with standard on-board battery packs. This compatibility allows you to still use your existing Gold mount battery packs on wide range voltage cameras (ARRI Alexa, Amira, Mini Alexa, Sony Venice, RED Ranger, etc.) when using a Helix mount plate.